Allison Smith FreePBX World Interview and 50% off Professional Voice Recording Promo! We recently interviewed Allison Smith during FreePBX World in Vegas! Best known for her work as “The Voice of Asterisk”, and the professional voice talent behind the standard voice prompts bundled with FreePBX, Allison also speaks and blogs about ways to design telephone call flows which won’t drive callers crazy. Watch the interview here, and read her latest IVR Blog below for tips and best practices for creating IVRs. 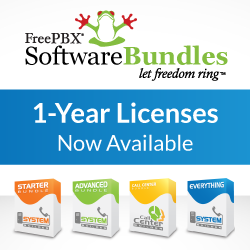 We have added Allison’s Professional Voice Services to our line up of Add-Ons for FreePBX. You can now purchase custom prompts directly in the Schmooze Portal. As a promotion to welcome Allison to the FreePBX Team, Use the PROMO CODE: “ivrvoice” from now until Friday September 19th at midnight central time to receive 50% off professional voice recordings! You’ve unpacked and installed your shiny new PBX – it’s an exciting time to be you! Everything’s configured; you’ve updated the modules – you’ve even explored the modules. You’ve got this. You’re primed and ready to enjoy the ease and flexibility that your new FreePBX affords….and then it dawns on you. This thing is the *gateway* to your company. You will have *actual* callers accessing your company via your PBX. It’s the entryway; it’s the launch pad for interaction. Their first impression of you. It’s very likely that *zero* thought has been given to the fact that the IVR that your callers will hear – this mechanism which sorts people into various “categories” so that their concerns can be most efficiently dealt with – is the first clue callers will receive about your company. It’s the first inkling of what you’re about; it’s about who you are. Yet, this crucial detail gets overlooked in the overall set-up of a typical new PBX install. In my daily work of voicing IVR systems – not only for Asterisk, but countless other systems, I’m amazed at the panicked state some people are in when they contact me. Here’s how it typically goes: “We need to get this system live as soon as possible – and I guess we need someone to voice the opening greeting. Maybe the after-hours message too. Oh! And mailboxes….we haven’t even thought about that….” I mean, they’re completely blindsided! While possibly the most overlooked aspect of your system, getting your prompts voiced by a pro is essential. And although – in the interest of saving time and cutting costs, it might be tempting to grab someone in your office and put them in a quiet boardroom with a rough phone menu jotted on a legal pad, it can’t be over-emphasized how essential it is to hire a voice-over pro to voice your system. Our core competency is consistency (keeping everything smooth and fluid), discipline (to keep energy and sound quality matching from session to session), and a pro sound set-up (nothing has ever sounded great recorded direct-to-phone with background noise. Ever.) Not to mention the ability to add an unmistakable tone of professionalism and authenticity to your front-end. There you have it! The first roadblock to a professional-sounding IVR is tackled: hiring a pro. In order for your IVR to flow logically, you need to have a basic understanding of just *what* goes *where*. You require a good handle on how many extensions you have at your disposal; how many extensions you should realistically actually *use*, and – most importantly – you need to confirm that there will be *service* at the end of those extensions. …or you simply sketch it out freestyle, it’s important to map out where each extension goes, what happens when the call is picked up, and how to escalate something of higher priority. I try to tell clients to trim their opening menu down to five options, max. Attention spans being what they are, and retention of what people hear being quite limited, it’s important to pare down the choices to the essential “top five.” Once a selection has been made, a sub-directory should only have about three choices. Any more than that, and the customer isn’t getting anywhere. I always tell the story of the cardiology clinic’s IVR I voiced, when – after 10 menu choices (five too many), the *last* prompt in the lineup was “If this is a medical emergency, dial 911…” Anything life-threatening, mission-critical, or time sensitive – front-stack that at the beginning of your IVR. Also, most commonly-pressed choices should be out of the way early; the deeper callers drill into the menu choices, the more specialized the request. Of course, it goes without saying that once an extension is assigned, it needs to actually *go* somewhere – a mailbox which is assigned and attended to. Occasionally, I will voice prompts for a small entity who wants to sound larger than they really are – to the point where fake mailboxes were created to fuel the illusion of having reached a multi-national. If – upon frequent calls to the company – the customer figures out that Joe from accounting is also Joe the CEO, it reflects badly; also hugely undesirable is a mailbox which grows and festers unchecked; someone having created it but has not appointed it to be anyone’s responsibility. “Mailbox full” can be a death knell for a customer to hear. That should get you started thinking about the framework for your IVR, and how all-important it is to set that solidly before writing your script. To learn more about planning IVR’s and professional voice recordings make your plans to attend Astricon in October, where Allison will be presenting The New Rules for IVR, and Using Asterisk to create “Her”. Previous PostQueue Call-Back BETA Free Trial and New Software Bundles!